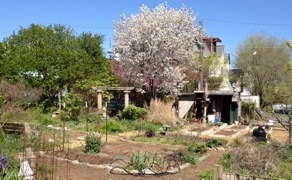 An executive committee is comprised of community garden members who have agreed to take on additional responsibilities to help make sure the Summer Winter Community Garden remains a thriving and prosperous community asset for all gardeners. Any active member of the community garden is eligible to serve on the executive committee. Executive committee meetings are held once a month. A member of the executive committee is expected to attend on a consistent basis. Access a PDF containing a brief report on discussion and decisions of the Executive Committee. Please limit your correspondence to topics that are not time-sensitive as the email mailbox is checked regularly, but not constantly, by volunteers. Applying for a garden plot is best made in person by visiting the garden during one of the scheduled work days held each month. A member of the executive committee is usually available at these times to answer your questions and provide information about the garden. You may also request an application by email. To be respectful of and helpful to fellow gardeners and to all who live near or pass through the garden. To maintain garden equipment and facilities, and to leave the condition of the garden and its environs in at least as good a condition as when you entered—turn off the water, clean and store tools, and so on. To participate in at least three Garden Work Days or 12 hours total. These days usually take place at least once a month during the growing season. Projects for these days are decided at the preceding executive committee meeting. Sometimes we have a number of student volunteers to help, in which case you may be asked to supervise others. If a gardener’s schedule makes it impossible to take part in the official Work Days, then the executive committee may assign a task that can be done at another time.